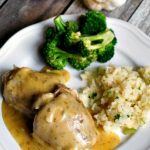 Instant Pot Tarragon Mustard Chicken–you’ll just need a handful of ingredients and a few minutes to make this creamy lemon and tarragon flavored sauce and chicken. Serve the chicken and sauce over rice, quinoa, potatoes or noodles. I’ve been making this easy chicken and sauce for several years in the slow cooker. I love how it just takes a few ingredients and a couple of minutes to get going. The lemon and tarragon pump up the flavor of the cream of chicken soup. We usually serve this over rice but last night we had it with quinoa. I’ve made this recipe with bone-in chicken, boneless skinless chicken thighs and with boneless skinless chicken breasts. It’s really just a matter of personal preference. I usually prefer tender, juicy chicken thighs. I buy a big bag of boneless skinless thighs from Costco. For the lemon juice part I have a tip to share with you. I like to buy a big bag of lemons and juice them all at the same time. Then I measure out 1 tablespoon of juice and pour it into an ice cube tray. I freeze the lemon juice in the ice cube tray and then pop them out and store in a gallon size ziplock bag. Then when I need a tablespoon of fresh lemon juice in a recipe I have it ready to go. It’s a little bit of work but it’s so worth it! To make Instant Pot Tarragon Mustard Chicken I used my 6 quart Instant Pot Duo 60 7 in 1*. I love this Instant Pot because it has the yogurt making function which I use almost weekly. It has two pressure settings (high and low), and there are also little slots in the handles so that you can rest the lid there instead of putting it down on your counter-top. You’ll just need a handful of ingredients and a few minutes to make this creamy lemon and tarragon flavored sauce and chicken. Serve the chicken and sauce over rice, quinoa, potatoes or noodles. Add ingredients. Add broth and chicken to the Instant Pot. Dump the cream of chicken soup on top of the chicken. Add in the garlic powder, tarragon and Dijon mustard. Pressure release. If you have time ideally you would do a full natural pressure release**. If you don’t have time you can let the pot sit there for 10 minutes after the cooking time is up and then move the valve to venting. Open the pot. Thicken the sauce. Add in the lemon juice. Turn the Instant Pot to the sauté setting. In a small bowl stir together the cornstarch and water until it is smooth. Stir the mixture into the pot. Stir a bit until the sauce is thickened. If you are using boneless chicken you may want to shred it or cut it into pieces. Serve. Serve the chicken and sauce over rice, noodles, potatoes or quinoa. **Full natural pressure release is when the cooking time is over and you leave the valve closed and allow the pressure to decrease without doing anything. Your pot will automatically switch to the Keep Warm setting. A natural pressure release can take anywhere from 5 to 30 minutes depending on how full pot the pot is. When the pressure is released, the float valve will drop and the lid will unlock. There is no beep or signal when the pressure is released. To make gluten free: Double check your broth to be sure it does not contain gluten. Also, “Pacific” brand makes a gluten-free carton of cream of chicken soup that is a great substitute. You can also search up homemade cream of chicken recipes. Like this recipe for Instant Pot Tarragon Mustard Chicken? Get all my new recipes delivered to your email inbox by signing up below. What cooking time do you suggest for chicken breasts if browned first? I prefer the look. I would cut down on the cooking time by 3 minutes. 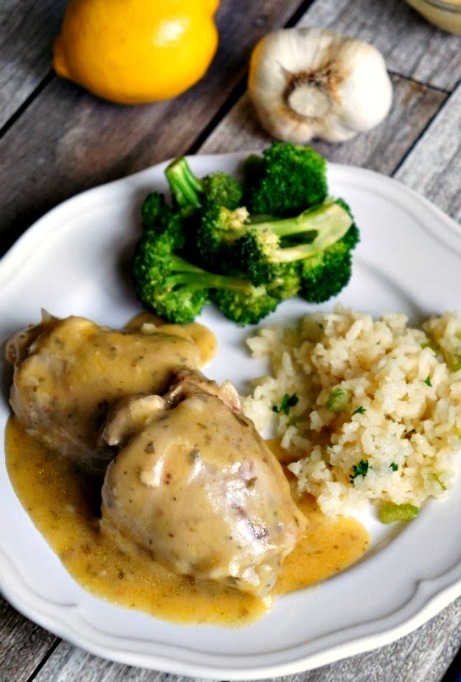 I love chicken recipes that use dijon mustard! Thank you so much for sharing. Can’t wait to make this at home. How would I go about cooking brown rice in the instant pot simultaneously with this chicken recipe? I know to put it in a separate bowl on the trivet, but what measurements, how much cook time, and any other considerations? Hi Dara, I would cook brown rice in the bottom of the pot. It is 1 cup rice to 1.25 cups of water. Then I would put the chicken and sauce ingredients in a pan on top of the rice. Perhaps use a trivet if you have one. I bet it would work out well. What type of chicken will you be using? Thank you for tips. I plan to use frozen boneless, skinless breasts. Do you think the brown rice will get done in the 12 minutes required for the breasts? I would cook for 22 minutes. Then let the pressure release naturally for 10 minutes. I believe the chicken will come out perfect. I love the taste of tarragon and mustard but can do without Campbell’s cream of chicken soup. I will make my chicken with thickened chicken broth.